Two Up contains a number of stories with accompanying illustrations; sometimes, however, these are just a selection of the photographs taken at the time. 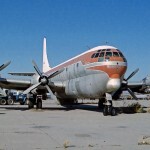 This post features a collection of photographs that were taken at the Pima County Air Museum, near Tucson, Arizona in February 1981. 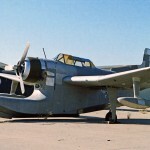 This selection features some of the rarer aircraft and is made up of images that were not included in the original Two Up story. Also included are some of the many aircraft in a restoration compound at Tucson Airport. 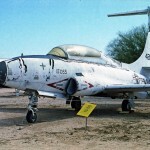 Pima County is a continuously evolving museum, with new aircraft being added and existing exhibits being restored over time. My own photograph collection reflects this, with several new and restored aircraft photographed during a subsequent visit when I was working with McDonnell Douglas Helicopters on assessment of the AH-64 Apache. In 1981, there were large numbers of Lockheed Constellations (and their early warning Warning Star derivatives) stored at MASDC and this is also reflected in the attached gallery. 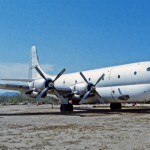 One interesting photograph looking into the MASDC compound is of a Lockheed DC-130. This is a Lockheed Hercules modified with four deep underwing pylons to allow it to carry and release up to four Ryan Firebee reconnaissance drones for use initially in the Vietnam War. Another rare aircraft is the Convair B-58 Hustler, a Mach 2 supersonic bomber – this is one of eight examples that are displayed in a number of museums across the USA. 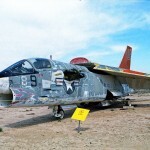 Hopefully this gallery captures something of the variety of fascinating aircraft that can be seen at the Pima Air & Space Museum and will be of interest to anyone who has seen the original piece in Two Up. 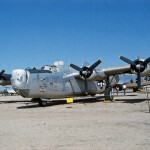 It also captures a snapshot of the collection of rare and unusual aircraft then to be found at Tucson Airport. Ling Temco Vought F8U-1 Crusader supersonic carrier-based fighter’ The variable incidence wing allowed a slower approach speed while maintaining a good forward view for the pilot. Grumman E-1B Tracer 147227 in the colours of VAW-307 of North Island Naval Air Station, California. The Tracer was an AEW adaptation of the ASW S-2 Tracker. 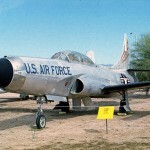 The Lockheed F-94 Starfire was a two seat fighter developed from the T-33 trainer. 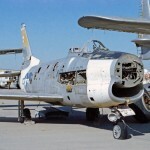 The F-94 featured an afterburner, search radar and nose- and wing-mounted rocket batteries. This is an F-94C 51-5623. 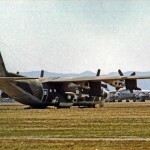 Lockheed DC-130 Hercules 56-527 in the MASDC compound. The deep underwing pylons were fitted to allow the carriage of four Ryan Firebee reconnaissance drones. Douglas WB-66 Destroyer 55-0395. This is a USAF version of the naval Skywarrior. This variant was used for weather reconnaissance, with two observers carried in a pressurised compartment replacing the bomb bay. The high-performance Convair B-58A supersonic bomber. 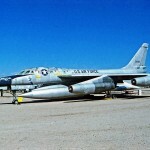 This aircraft 61-2080 was the last of 116 B-58s to be built. Lockheed T-1A Seastar 144200. 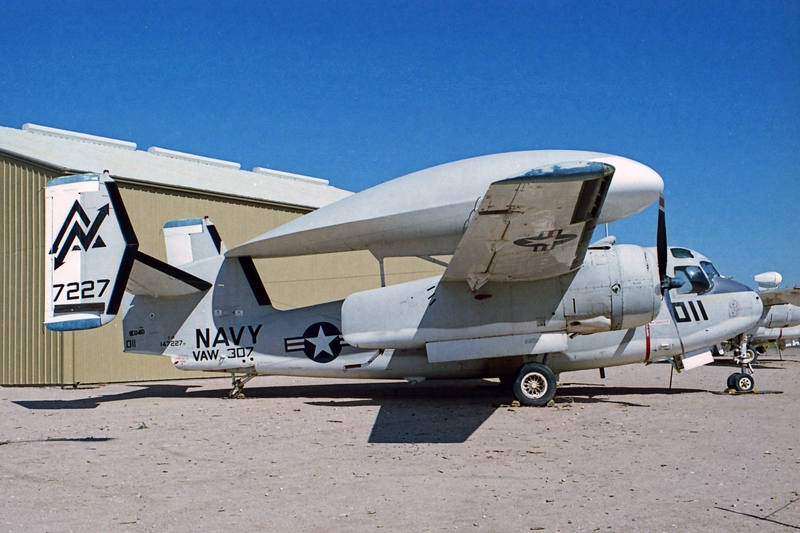 The Seastar was developed from the T-33 for naval carrier training. The main distinguishing features are the raised rear (instructor’s) cockpit and the resulting enlarged vertical fin area. Of 150 built, this is one of two known survivors. 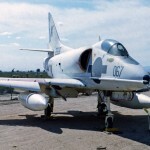 Douglas A4D-2 (A-4B)Skyhawk 142928. This diminutive naval attack fighter was designed by Ed Heinemann and is known as ‘Heinemann’s Hot Rod’. 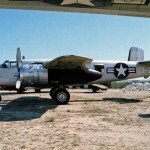 The B-24J showing the port side USAF markings. 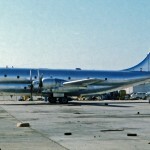 The earliest version of the Constellation is the L-049. This is N90831 (42-94549) in contemporary TWA markings. 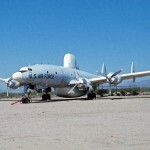 The Lockheed EC-121T is an electronic reconnaissance version of the Lockheed Constellation. This is 53-0554. Convair F-102A Delta Dagger supersonic interceptor. The aircraft on display is 56-1393. 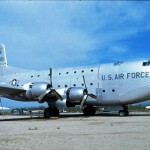 The double-deck Douglas C-124C Globemaster II 52-1004. A total of 447 of these aircraft were built and the name is continued with the current Boeing C-17 Globemaster III. 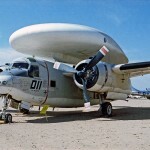 Another EC-121T Super Constellation, this time without dorsal radar. 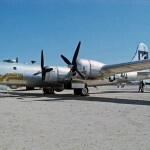 This is 53-0548 USAF and is now displayed at the Yanks Air Museum, Chino, CA. C-97G HB-ILY . 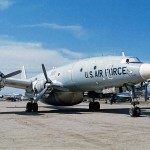 This aircraft was delivered to the Air Force as KC-97G 52-2626. 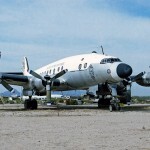 It was leased to Balair of Switzerland and served in the Biafran airlift in 1969 – 1970. The North American B-25J Mitchell medium bomber. This aircraft is 43-27712. In Two Up, Jim recounts his experience of a flight in a similar aircraft. North American RA-5C Vigilante. This is one of the largest and highest performance carrier-borne strike aircraft. the museum example is 149289. 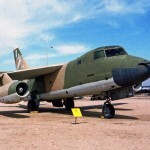 Although originally intended as a nuclear strike aircraft, the type was redeployed in the reconnaissance role. 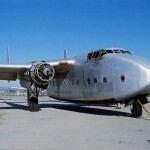 The last surviving Stratocruiser – eventually to be scrapped in 1982. The unique Columbia XJL-1 amphibian at Tucson Airport. 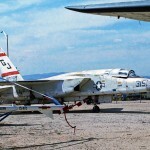 This aircraft was subsequently moved to the Pima museum. 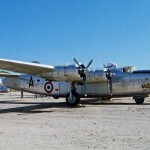 A Fairchild C-82 – predecessor of the Fairchild C-119 Flying Boxcar. 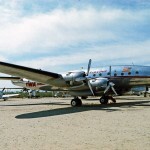 C-82s were still in use in Alaska when I visited in 1985. 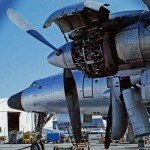 An evocative photo of an ex-USAF Super Constellation undergoing maintenance in the restoration facility. 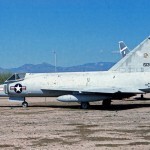 An ex-Iowa Air Guard North American F-86D Sabre bakes in the sun on the restoration ramp at Tucson.